My first thought is that the city of Cap Haitien is a war zone. Originally built for a population of 50,000, it swelled to an estimated 500,000 – 750,000 after the 2009 mudslides and the 2010 earthquake. 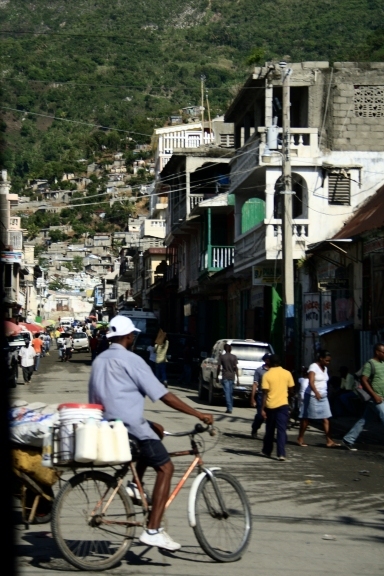 Because it has an airport, the city is the introduction to Haiti for those who fly into the northern part of the country. Time, politics and population has not been kind to the city. Dilapidated buildings are falling down, many abandoned in mid-construction or missing walls or ceilings. 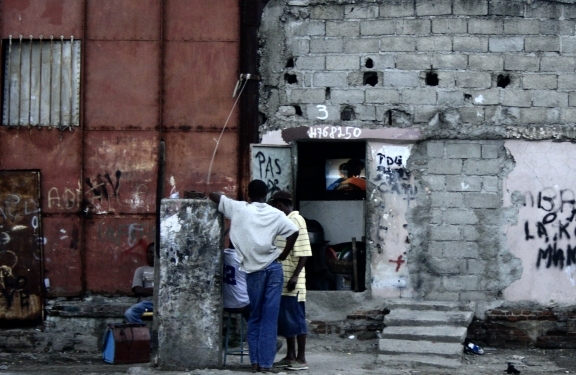 Once the pride of Haiti, now the city seems grey. There is no maintenance of infrastructure, and the roads are rutted and potted. I try to capture photos, but we are driving too fast. So again, my brain gathers images. Pigs root through canals filled with garbage, chickens peck at mounds of rot, skeletal dogs scrounge for any morsel of food they can sniff out. A cow saunters across the road, a baby goat darts amongst the traffic, bleating, ears back against his head. Rick tells me that people pile the garbage at roadside and periodically someone comes and shovels it by hand in wheelbarrows to take it away. NGO-supplied dumpsters along the river are useless as there are no trucks to empty them, no place for disposal. People fill doorways, sidewalks, street corners. Tap taps lurch by (small, brightly-coloured trucks for transporting people), people huddled in the back, or hanging from every grippable surface. If you can hang on and you have a few gourds, you can get ride. On the unfinished second floor of a building, a man sits on a kitchen chair, a laptop in his lap. A woman has set up tables with grocery items in a three-sided cinder-block building – its roof and front wall having fallen. I realize that each night, she must pack everything up and take it home, then return again the next morning to start over. Every block has one or two small shops with rusted, dirty car and motorcycle parts or used tires, a barber shop and a moneychanger and a bank. A small boy hammers repeatedly on a large piece of metal. A group of men dismantle stacks of microwaves, stereos, televisions, transistor radios, toasters, computers for the parts. 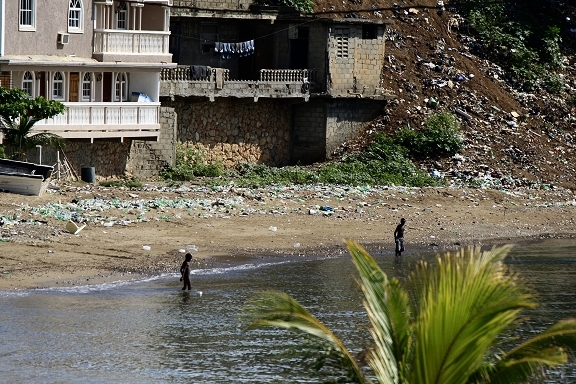 Haiti truly must be the recycle capital of the world. Tiny 6×8 shops bear hopeful names like Patience Bank, Jehovah Jirah Construction, Good News Bazaar, Divine Grace Motor Repair, Bless me Jesus Barber Shop. A truck passes, its windshield emblazoned with the word ‘Relax’, another with ‘Jesus Saves’. Horns blast, traffic swerves, people weave among the venders, motorcycles, piles of garbage and animals. They call this the Ribbon of Wealth. Here, everything is for sale. I see venders selling used blenders, grilled corn, car parts, toilets, wooden chairs, coffins, cases of pop and candy, baskets of dried beans, plantains, umbrellas, sunglasses, used jeans, piles of used shoes, fresh roasted peanuts, bags of cement, charcoal, books, movies, rice, eggs, used furniture. 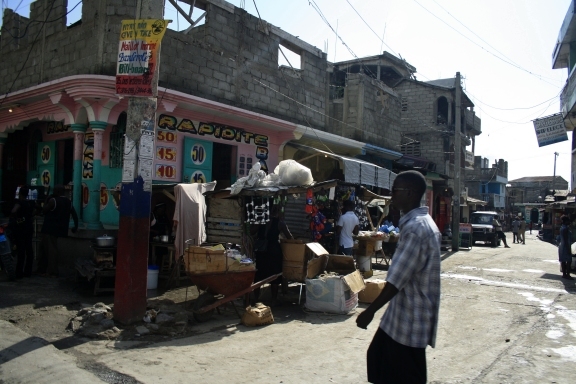 “Haitians are the ultimate entrepreneurs,” Rhonda says. I cannot take it all in. Then, in the midst of the noise and dust and poverty and dirt, I begin to notice something. The tiny shops are immaculate. Street venders have lined their products neatly in rows. Although dust billows everywhere, the products are kept clean. 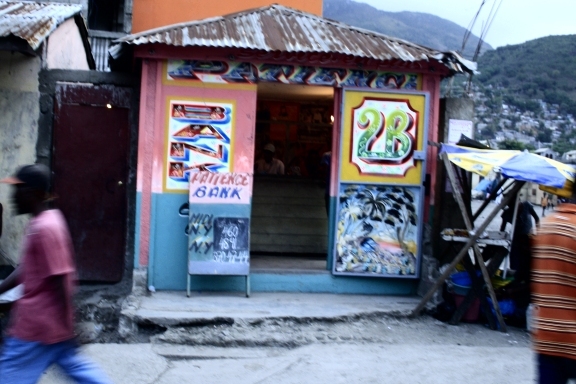 Some entrepreneurs have painted their storefronts in bright colours. Others have cleared away small spaces in the garbage and decorated their stalls with fabric or colourful umbrellas. Men hand-mixing cement in wheelbarrows and pouring it into molds to create pretty pillars, decorative bricks, and artistic vents, have stacked and displayed their handiwork with care. I notice the most exquisitely carved wooden bed and dresser on the side of the road. Rhonda tells me it was hand-carved; she points out others. Through the arched openings in an ancient brick building with mortar crumbling and no roof, I see what appears to be a small furniture factory…chairs and tables in various stages of assembly and finishing. A truck bearing huge speakers cruises the block, blasting Haitian music. Beautiful artwork decorates plywood walls. In the midst of all the craziness and struggle, creativity gleams. The people are impeccably dressed – their clothing may not always be the proper size and may bear odd American slogans – but their apparel is clean and pressed and smart. Braided and woven hairstyles are works of art. A trio of school girls skip along in their uniforms, matching ribbons in their hair, holding hands. A small boy in a bright white shirt, black pants, and shined black shoes jumps over a ditch. A small girl in a coral dress skips through an empty lot. An elegant woman saunters down the street in a bright red dress, sandals and purse, back straight, a case of pop balanced on her head. People here make a few gourds any way they can, but they hold their heads impossibly high. In the bold eyes that meet mine as we pass, I see strength, pride and dignity. I realize with a start that I feel a twinge of envy. That I suddenly feel hot, tired and dowdy. We make a turn and abruptly leave the noise and confusion behind for the waterfront. On the sidewalk, I spot a brand new leather sofa set, a dining room table and chairs, lamps still wrapped in plastic, three or four coffee tables. A little further on, three Haitians are upholstering a matching sofa and chair. A beat-up Ford hunkers beside a Humvie. Never before have I seen so many things that surprise me in such a short amount of time. In this new tranquility, we leave a beach of garbage lining the turquoise ocean to the right, then move onto a lovely promenade with waves splashing against the sidewalk. Salt air replaces the smell of sewage, mildewed concrete buildings give way to a fancy hotel with white filigree verandas and restaurants. On the bay, a quartet of young men in a small fishing boat wrestle with a patchwork sail. I begin to sense the paradox of this city. New juxtaposed against old; affluence alongside poverty; hope aside despair; faith beside defeat. I spot a couple boys swimming. Their laughter carries like music on the wind. This is Day One in Haiti. What a powerful piece! You have captured the reality of life and have done a beautiful job of showing how things are there. What an experience, rich beyond measure. First world plastic becomes a Third World problem, and it will all wash into the ocean which joins us together as one. great dicription of similar places I troweled throug ! circumstances ! It even makes them stronger ! ( you should have known this writing about me ) …….Mary…. 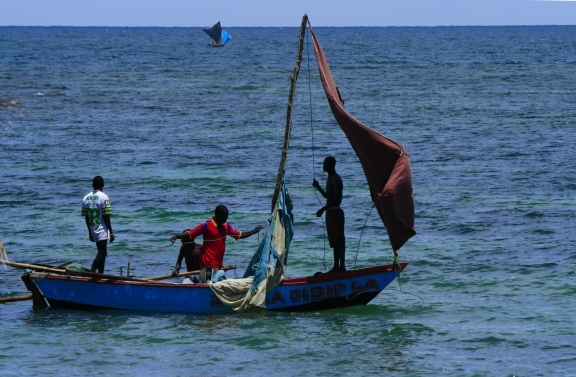 The president of a holding company that owns various businesses (tourism, shipping, warehousing) in Cap Haitien contacted me for a project his foundation is interested in–providing colorful, durable sails for fishermen in small fishing villages in the area. In trying to research the types of boats and sails used by the fishermen, I came across the photo in your piece of the young fishermen struggling with their sails. Clicking on the photo led me to this page. Your insights about the creativity of the people suggests that if provided a sail, the fishermen will fashion a mast and spars to fit the sail instead of the sail having to fit a designer’s sail plan that in turn fits a mast and spars for a particular boat design. I think these understandings will allow me to fashion a more realistic proposal for this project. Have you written more about your visit to Haiti? I’ve written here on my site, and for a local magazine. David…your project sounds valuable. I found the Polysail Facebook page and we were in the exact same spot – the photo above was taken at your Fishermen’s beach. Can you provide a link to your website, David?